My first day at Warner Nature Center I had a note on my desk from the director Tom Anderson. It read something to the effect of "Off to fulfill my pleistocene hunting heritage." It was a nod to author Paul Shepherd. 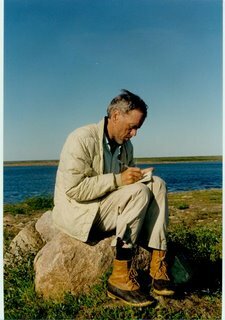 In Ecology and Man, Shepherd said, "If nature is not a prison and earth a shoddy way-station, we must find the faith and force to affirm its metabolism as our own---or rather, our own as part of it. To do so means nothing less than a shift in our whole frame of reference and our attitude toward life itself, a wider perception of the landscape as a creative, harmonious being where relationships of things are as real as the things. Without losing our sense of a great human destiny and without intellectual surrender, we must affirm that the world is a being, a part of our own body." Now, as Tom resigns his position at the reigns so he can pursue other adventures , it is hard to imagine Warner without him because Warner is a part of his being and his being is part of Warner. He has eaten apples of the trees, eaten fish from the lakes and deer from the woods. These things all became part of Tom but it is the experience of place at Warner that has shaped him over these past 29 years into the person he is. Every tree, every boulder, fen, marsh and every hand full of glacial till has subtly shaped his life and as such, Tom is as much a part of this land as this land is a part of him. His relationship to the land and to us is just as real and as valued as the physical materials that make up the whole. It is hard to imagine Warner without Tom because in many ways they are in unison. They always were, are now and will forever be one and the same. It will be hard to imagine but when the day comes that Tom is not here every day it will, in effect, be a little like my first day. Tom may not be here physically but his influence and presence will be here even when he is out in other wild places. You cannot truly remove Tom from Warner because you cannot remove a person from themselves.